These cheesecake bars are A-M-A-Z-I-N-G, I have made this a couple of times at the request of my neighbors, they are quite rich though so feel free to cut the sugar amount in half if you want a little less sweet cheesecake. Preheat your oven to 350 degrees. Then line the bottom of a brownie pan with tin foil, leaving an overhand on each side so it’s easy to life the bars out. In your food processor, add the 20 Oreos, and the 2 tablespoons of sugar, blend until fine, while that is going melt your butter, when the Oreo sugar mixture is done add in the melted butter and blend again. Pour the mixture into your tinfoil lined pan, and firmly press the mixture into the bottom of the pan, place in the oven for 15 minutes then allow to cool. Place cream cheese in the food processor and blend until smooth, add in sugar, pumpkin puree, eggs, flour, pumpkin-pie spice, and salt, blend until completely combined. Place the chopped chocolate in a microwave safe bowl and melt in 30 second increments, add 1 cup of the pumpkin cream cheese mixture to the chocolate and stir thoroughly. Pour the remaining pumpkin cream cheese mixture over the Oreo crust and smooth out. 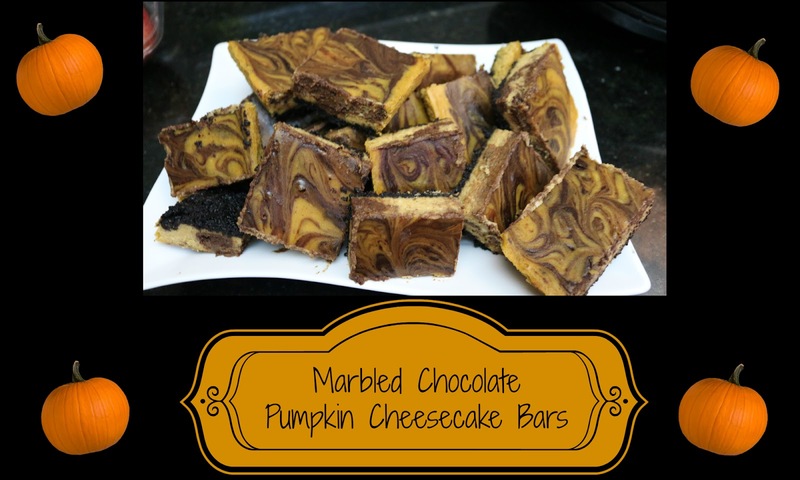 Then take a spoonful of the chocolate mixture and drop into the pumpkin cheese cake mixture randomly, using the end of your spoon or a cake pop stick swirl the chocolate dollops into the mixture to create the marbled effect. Bake in the oven for 45 minutes or until cheesecake is set but still jiggles slightly. Cool in the pan, then cover and chill until firm (minimum of 3 hours). Using the overhang of the tin foil lift the bars out of the pan, cut into 16 squares. Tag me in your photos and use #KatieBeeBaking so I can see all of your wonderful treats! !